Atelier Paysan, the French collaborative for open-source farm tools, now has an English language website! Atelier Paysan is a great partner of Farm Hack and their website is a treasure trove of amazing information and tools, so we non-french speakers are very excited about this! On the new English language version of the site, you can read about the work and structure of the cooperative organization, their events and trainings, general design and build methodologies, and tool descriptions with technical drawings. One of these tools is the Triangle Quick Hitch, which was the focus of a Farm Hack event in 2012 and is also documented on the Farm Hack site. This is a system several farms in the US have already implemented as a cheaper, open-source alternative to proprietary quick hitch systems, and one that is already more widespread in Europe. With tutorials and technical drawings to build 16 tools adapted to organic vegetable production, this book is an instruction manual for becoming self-sufficient in terms of farming machinery. Included are principles of self-building, methods and techniques, regulatory considerations, and most importantly, examples of tools tested by vegetable growers presented in the form of building tutorials, allowing you to develop your skills and expertise around the tools you work with. The guide is spiral bound and 246 pages long with a folding cover, designed to be easy to use and long lasting. It will accompany you in your farming project and throughout your career. It’s a source of inspiration which you can use and enrich with your own adaptations. Unfortunately translating this guide book into English is a big project, so it has not yet been done. If you have several thousand dollars or an inclination to translate this technical manual, get in touch. 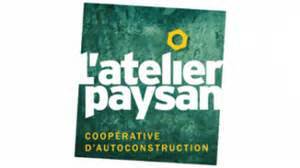 The work of Atelier Paysan in the field of training farmers and organizing collaborative development and building of tools for biological agriculture is truly inspiring to us, and we look forward to continue learning from and collaborating with them!